I’ve submitted a panel idea for South by Southwest 2008. If enough people vote for it, I’ll by talking about “AJAX and Flash mistakes”. My theory is that people talk way too much about successes, and not enough about their failures. We’ve had plenty of each, but if accepted, I’ll be talking exclusively about our failures. So please: vote for me! The panel picker interface this year is very gmail-esque and cool. My talk from last year was an inspirational little thing about how Flash and AJAX have a lot of synergies. Check it out below. Social websites are funny places. What stories do you tell over drinks with friends? Tell us about when someone accidently revealed their company’s business plans, or uploaded the *wrong* folder of pictures to your site. Share stories of funny bugs, features gone haywire, or crazy customer emails. Stories solicited from audience (maximum 5 minutes / story). LinkedIn Answers: a killer social app? A few days ago, I simultaneously posted a question about source control structure to my blog and to LinkedIn Answers. My blog got one response. LinkedIn answers got, as of now, 14 extremely well-thought out answers (more are coming in every day). The quality of the answers is pretty remarkable, as is the fact that none of the people responding are people I know. They may be distantly connected to me on linked-in, but they aren’t on my contact list. 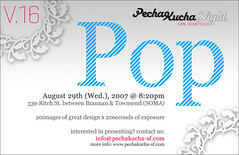 Pecha Kucha SF is gonna rock! Pecha Kucha is a really cool design-geek event that originated in Japan. The format is somewhat similar to PowerPoint Karaoke, with some important differences. Participants design a 20-slide slideshow, and have 20 seconds PER SLIDE to talk over it. The timing is done by computer, so you don’t have any leeway, and have to time your presentation perfectly for it to work. Pecha Kucha – Japanese for chitchat – began in 2003 in Tokyo as a way for emerging designers to share ideas. The wildly popular concept has now caught on here, with San Franciscan chitchatters meeting every last Wednesday evening of the month, usually at 330 Ritch. The format is simple: presenters curate a 20-image slide show about their creative work; each slide is shown for exactly 20 seconds; and each night has an overarching (and often disregarded) theme. Anyone can sign up, though it’s mostly designers and artists talking about their work – which can range from Burning Man sculptures to mass-market furniture. But you never really know what you’re going to get: recent nights have seen a writer, a couple of software developers, a social engineer presenting an interesting theoretical exercise, and a creative vacationer with some gorgeous images of plate tectonics in the Colorado basin, graffiti in Australia, and the state of socialist architecture in Eastern Europe.